ATLANTIC CITY — Unite Here Local 54’s strike at the Trump Taj Mahal Casino Resort is on track to become the longest work stoppage in the history of city’s gaming industry, surpassing the previous record of one month set 12 years ago. The strikes, while having similarities, came at very different periods in the casino industry’s history, said Deb Figart, a labor economist from Stockton University. Robert McDevitt, left President of Local 54 Union along with Wyclef Jean,right march togther down Pacific Ave to support the strike against the Casino in Atlantic City, N.J. Saturday, Oct 16, 2004. Robert McDevitt, left Local 54 Union President along with Union members from allover march togther down Pacific Ave to support the strike against the Casino in Atlantic City, N.J. Saturday, Oct 16, 2004. 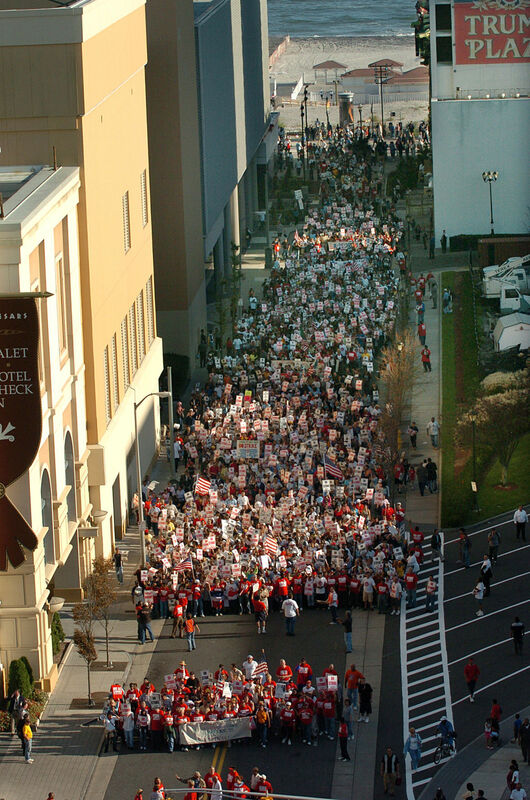 On Oct. 1, 2004, nearly 10,000 hotel and restaurant workers at seven Atlantic City casinos walked off the job. The noisy, chaotic strike, involving acts of civil disobedience, marches and celebrity appearances, was the focus of local and national media attention. A month later, Local 54 called off the strike, following a 15-hour bargaining session. The union dropped its demand for a three-year contract, accepting a casino-favored five-year deal with limits on subcontracting. On Nov. 4, the striking union members returned to work at casinos; both sides agreed to drop all civil complaints filed against each other, ending the acrimony. Below is a look at the strike in photos.